On Friday, July 15, at 7 am, Rocky Mountain Incident Management Team Black will transfer the management of the Cold Springs Fire back to the local Boulder County Type 3 Incident Management Team. This is the final report of the Type 2 team, but not the final fire report. Thursday, July 14, 2016 12 p.m.
Information Hours: 6 a.m. – 10 p.m. 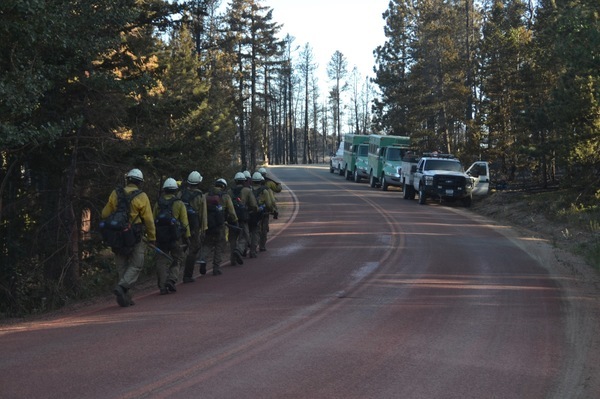 Firefighters continued to make good progress on all fronts of the Cold Springs Fire. Crews will continue to secure the fire perimeter and mop-up around structures. Fire-weakened trees and smoldering debris in mine shafts are hazards firefighters continue to address. Today’s weather forecast includes temperatures in the mid-70s, winds out of the west/northwest at 7-11 mph, and increasing relative humidity in the afternoon. The Cold Springs Fire has burned 528 acres, is 80% contained, and has burned predominantly on private land. Aviation resources conducted a total of 86 missions over the Cold Springs Fire. Fixed wing aircraft flew 89.7 hours and rotor wing aircraft 63.0 hours. A total of 127,809 gallons of retardant and 209,873 gallons of water were dropped on the fire. There were a total 12 Type 1 and Type 2 crews, 173 overhead personnel, and 112 pieces of equipment including fire engines, water tenders, and dozers working to contain the fire. Firefighters came from as close as Nederland, Colorado and as far away as Washington and Montana. A total of 5868 meals were served to incident personnel and cooperators. The maximum number of personnel on the fire totaled 544. There were a total of 196 law enforcement personnel assisting with evacuations, medication runs, animal evacuations, fire perimeter patrol, and roadblocks. The Cold Springs Fire perimeter stretched a total of 7.1 miles within which eight residences and numerous out buildings were destroyed. Due to the progress in containing the Cold Springs Fire and residents returning home, daily community meetings at 1 pm and press briefings at 5 pm concluded on July 13, 2016. Residents returning to the Cold Springs Fire area should expect to encounter a variety of hazards that include fire-weakened trees, blowing ash, stump holes, and smoke over the next few weeks within the fire perimeter. Homeowners are encouraged to visit www.ColdSpringsFireRecovery.org or www.BoulderOEM.com/Emergency-Status for recovery-related information. On Friday, July 15, at 7 am, Rocky Mountain Incident Management Team Black will transfer the management of the Cold Springs Fire back to the local Boulder County Type 3 Incident Management Team.